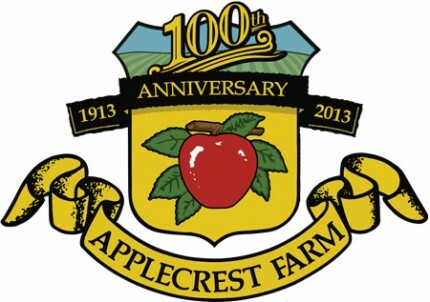 Congratulations to the Winner of the $1,000 Applecrest Your Farm Story Contest! Congratulations to the winner of the $1,000 Applecrest Your Farm Story Contest, Renee Addario Evelyn! Renee’s essay was one of many submitted in the contest, celebrating Applecrest’s 100th Anniversary. It was wonderful to hear how the farm has affected so many visitors, employees and families over the past century, in such different and profound ways. Renee Addario Evelyn is a successful fine art portrait photographer based in Exeter. She had her first “real job” working at Applecrest over 20 years ago, and the work, the relationships and the sights and smells remain some of her favorite memories of growing up. Renee’s portraiture work combines her technical knowledge with her love of fine art to produce beautifully genuine, thoughtful and artful portraits for families, graduates, events and weddings. You can check out her work at www.RAEvelyn.com. Renee lives in Exeter with her husband and two young children and will write a novel someday. And now, we proudly present the winning story in its entirety. Congratulations again, Renee! It was all of it. The wafting sound-waves of the twang of bluegrass music in the distance; the louder grumbling of tractors coming to a slow stop; the smell of everything cooking, roasting, baking, boiling; the dust floating, blowing from the slumbering cars on the dirt road searching for any open space. The colored blur of children running, racing, darting, jumping past and their sounds; the screech, the wail, the laugh, the roar. As a sixteen year old girl, I soaked all of it into my skin and hair, going home smelling like a campfire, ashes sprinkled over my skin and clothes. But it was until much later, maybe twenty years later, that I realized all of it had also been soaked into my body, my being, my soul. The farm, the Wagner family called it. I was hired the fall of my sophomore year of high school, during the fall festivities; the outdoor experience for most people living around the NH seacoast and many beyond, even into MA and ME. I didn’t know what I would be doing, just that it would be outside at one of the turned-on-its-side apple palettes, used as a selling counter. It could be selling pumpkins, apples, roasted corn and hot dogs, or stocking these areas with their necessary bags, foods, paper goods and condiments. Immediately, I started at the hot dog grill and pretended I knew exactly what I was doing, but truth be told, my 16 year old self had never grilled anything before, not even cheese. Once I worked through my young nerves and doubts, I quickly became the only hot dog griller each Saturday and Sunday throughout the fall, for about three years. I set up the grill and the dogs and cleaned up when the last customer walked through the dust to their car. The nighttimes were always cool and crisp, with the tingling, pink skin of a slight burn from the fall sun and the heat of the grill. Each hair on my fingers and arms was either gone, or short, with the white twist of charred hair. There wasn’t a better job on the planet. Through the rest of my high school years and my all of my four years in college, I worked at the farm. I worked hard. I carried and dug and weeded and landscaped and sorted and cut and baked with sore feet, red fingers (stained from strawberry juice AND hard work), dirty clothes and callused hands but with hard, strong legs and arms and a feeling of pride, accomplishment and ownership; those were my hot dogs, my planted and weeded flower beds, my perfectly stacked bag of apples and my cut fruit for pies. But really, that wasn’t even all of it. There were friendships, crushes, parties, car rides, tractor rides, trips to the coolers, and the apple press, behind the ovens, the trees and out to the migrant housing. There was the time in the summer of 1992 that I sat in the red, wooden “pick-your-own-berries” shack, that in between weighing and logging and making change, I was reading “A Prayer for Owen Meany” by John Irving. It was a summer assignment for school; the first of Irving’s books I had read. I fell in love that summer. With Owen Meany, with reading, with writing, with Irving. It must have been soon after, fall maybe, that I’d read that Irving was from Exeter, went to UNH (like I would) and that he worked at the farm too. He knew what I knew and I wanted him to know that I knew. A co-worker told me that Peter Wagner still kept in touch with Irving and that his parents still lived in Hampton. Immediately, I asked Peter for Irving’s address. With no hesitancy, he wrote it in pencil on a scrap of paper and handed it to me. I wrote to Irving, told him what I knew and told him I had fallen in love with Owen Meany and would he please consider speaking at my high school graduation in June of 1993. The day I received a response will be etched in my brain forever. On his beautiful linen typing paper, he typed to me with a typewriter; the text tilted to the left a bit and slightly faded, as if his ink ribbon needed replacing. He said “no” he wouldn’t speak to my class and guests. He was busy writing, finishing a book and added, “It seems so brainless, somehow, for someone who is 50 (soon to be 51) to be advising people of your age about anything. I mean, if we knew what we were doing, the world would be a better place.” He went on to say someone younger, maybe one of his children, would have more to say to my generation than he would, that Owen Meany would have made a pretty good commencement speaker, but not Irving himself. It was perfection. It was almost all of it. But there were also trips into old Mrs. Wagner’s house at the end of the day, with a metal box full of straightened dollar bills, in order from smallest to largest and clanking coins separated by type. It was hearing her say “Renee, come here for a minute” as I lay the box on her counter quietly, not knowing if she heard me come in or not. Each time, she would be sitting inside her kitchen booth, hidden from guests. When I turned to her, her slight, but strong body, sitting on the right side asking me to sit across from her. She might have a steak, or a potato in front of her, but there was also a wafting cigarette and a small iced glass of bronze colored liquor. She was in her early eighties, fluffed white hair and long limbs and fingers. She might ask how my day was, how busy we were, how things went. But sometimes, she would ask about school; how it was going, if I liked it. And then she might tell me that she went to college in the late 1920’s, that she was one of only a handful of women. She was stern and serious, with rarely a smile or a nod. She walked with purpose; head lowered to look at everything; vegetable displays, apple arrangements, pumpkin color, donut freshness and cleanliness of the entire customer area. If an apple wasn’t placed just right in a bag, or the ketchup bottle was dripping, or an employee didn’t greet a customer with a hello, she wouldn’t take you aside to speak with you quietly, confidently. In her strong voice, she would demand that it be cleaned, moved, fixed somehow; just get it done, now. But if you could see through the tough, stern exterior, there was a woman to learn from. Throughout my years at Applecrest, we would continue our conversations which I began to treasure. She taught me about hard work, confidence and feeling appreciated. One day, she even put her arm around me and I started knowing then what I now know for sure. That was it. All of it.